Stanislas Wawrinka claimed his first ATP 1000 Masters title, nearly three months after he won his first major in Australia. The new Swiss number one beat his fellow countryman Roger Federer in three sets to take his second title of the year and keep himself third in the world rankings. Federer will remain fourth after his impressive week which saw him beat number one seed, Novak Djokovic on Saturday. It was the 17 time Grand Slam winner who took the opening set, 6-4, continuing where he left off the day before. Under new management with Stefan Edberg, Federer terrorised his opponent who was unable to predict his serve. On the fifth game, the fourth seed made his move and broke his rival’s serve after earlier threats and then held on to take the opening set. Wawrinka made a racing start in his semi final against David Ferrer but this time he had to battle back after making multiple errors. Early in the second set he found his feet and went on to break the Federer serve after a couple of uncharacteristic double faults. His advantage didn’t last long though as the score was levelled after another break from the other side of the court. Staying resilient, Wawrinka pushed Federer to a tie break and from that point on, his 32 year old opponent appeared to run out of gas. ‘Stan the Man’, as he is otherwise known, was the first player from outside the ‘Big Four’ made up of Federer, Djokovic, Rafael Nadal and Andy Murray to win a Grand Slam since Juan Martin Del Potro’s heroics in New York five years ago and now is only the third to take one of the last 37 Masters crowns. 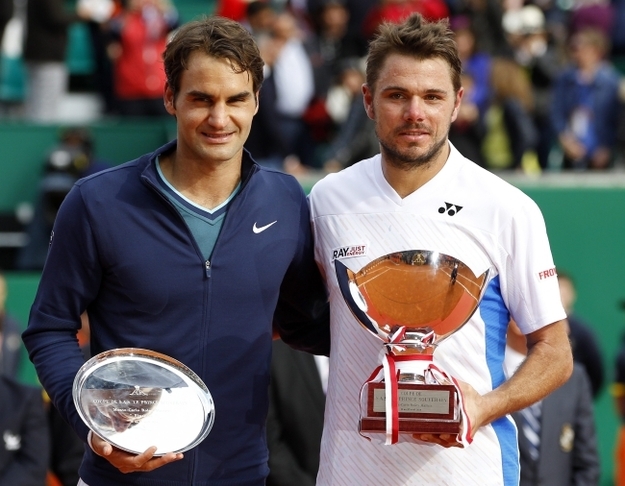 Off the court, Wawrinka and Federer are good friends, especially after playing a lot of tennis together in the Davis Cup. Throughout the match it was clear to see that they were aware of each other’s strengths. Both players are renowned for their strong single handed backhands and they were often caught in a cross court duel. Federer looked the more tactical in the first set but after losing the pinnacle tie break, he was unable to retrieve Wawrinka’s deep shots forcing him well behind the baseline. In the final set, Wawrinka raced to a 4-0 lead and despite his opponent holding his serve there after, the Australian Open champion held on for his fourth clay court victory. The champion was relieved to get past his team mate after revealing he was quite nervous before the game as this was the first time they had met in the final. Considering Federer has the ability to switch up the pace of his game from long rallies to a short serve and volley, it can be difficult to stay in the game, but Wawrinka was able to dictate the match after taking the vital second set. There are two more Masters events on the red dirt before the second major of the year. With Federer considering to miss the tournament, Djokovic battling against an arm injury and Nadal slightly off form after being knocked out in the quarter finals of this event, Wawrinka will be hopeful he can come close to another slam.